2017 U.S. Crime Rates Expected To Show Drop-Off Attorney General Jeff Sessions has been traveling this week to push an effort to crack down on crime. Meanwhile, a new report says data undercut claims that the U.S. is experiencing a crime wave. 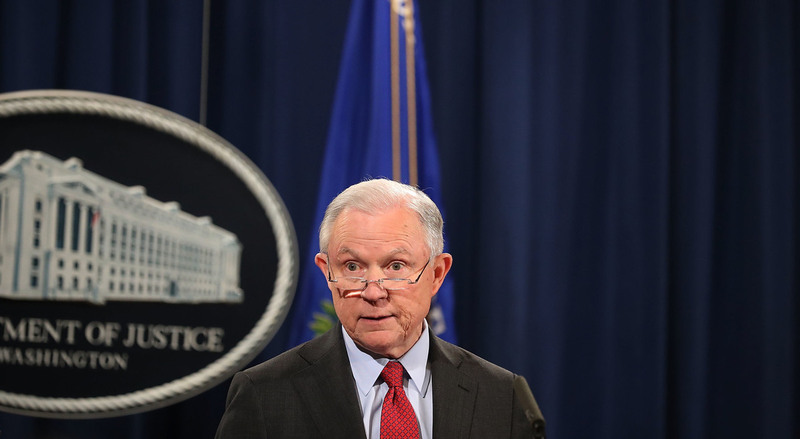 Attorney General Jeff Sessions holds a news conference at the Department of Justice last week, highlighting his department's fight to reduce violent crime. This week alone, Attorney General Jeff Sessions has visited three states to push the Justice Department's efforts to crack down on what he describes as a crime wave sweeping the nation. And while crime levels have risen the past two consecutive years from historic lows, a report released Wednesday by the Brennan Center for Justice at New York University's School of Law indicates a reversal in that trend for 2017, with the rates for overall crime, violent crime and murder all projected to fall. The Brennan Center's analysis is based on preliminary data collected from police departments and city reports in the nation's 30 largest cities. The report says its findings undercut claims that the U.S. is experiencing a crime wave. According to the study, the overall crime rate in the 30 largest cities is estimated to fall in 2017 by 2.7 percent compared with in the previous year, while the violent crime rate is projected to inch down by 1.1 percent. The biggest drop is projected in the murder rate, which the report estimates will decline by 5.6 percent. It says that significant drops are expected in Detroit and Chicago, where the murder rate is projected to fall by 9.8 percent and 11.9 percent respectively. Trump and Sessions have repeatedly singled out Chicago as a city awash in crime. The city did experience a significant jump in murder in 2015 and 2016. It is not good news across the board: The Brennan Center says the preliminary data show some cities, including Baltimore and Charlotte, N.C., will see their murder rates increase. Data on violent crime rates were available from 28 cities, while data on overall crime rates were available from 20. "This is all the more reason why the Department of Justice will keep focusing its efforts on fulfilling President Trump's promise to reduce violent crime, enhance public safety, and stem the tide of a devastating drug epidemic that is decimating communities across America," Prior said. He said the department is waiting for FBI crime statistics for 2017, which he called "reliable data." Sessions has made cracking down on crime, particularly violent crime, a central tenet of his tenure as attorney general. This week, he visited Wisconsin, Ohio and North Carolina to tout the administration's strategies to fight crime. "As attorney general, I am committed to combating the surge in violent crime and supporting the work of our police officers," he said Tuesday in Charlotte, according to his prepared remarks. "I have made it one of our top priorities both in word and deed." The violent crime rate did increase in 2015 and 2016, but it remains at historically low levels, according to statistics released by the FBI in September. For example, the murder rate for 2016 was 6 percent lower than a decade ago, while the violent crime rate for 2016 was 18 percent below the 2007 tally. Looking back even further, the violent crime rate is dramatically lower than the peaks of the 1980s and early 1990s. In 1991, for example, the rate was 758 per 100,000 — roughly double what it was in 2016. Since 1991, the violent crime rate has consistently dropped — with a few exceptions in the mid-2000s — until seeing modest increases again in 2015 and 2016. The murder rate for 2014, for example, was about 4.4 per 100,000, which was the lowest it has been in decades. The FBI is expected to release its 2017 crime figures next fall.